Using natural gas pool heaters is a very efficient solution to your pool’s heating problems all year round. They heat up fast and are much less expensive to buy and more so to install compared to other types of pool heaters. These products, however, are not perfect. For one, natural gas pool heaters have much more expensive operational costs compared to others. The difference may be somewhere around a hundred dollars annually, but probably wouldn’t be as expensive as half a thousand. Another knock on natural gas pool heaters is that they’re not quite durable. They only tend to last for about five years or so. Even worse is that when they do last longer than half a decade, they often require extensive maintenance and replacing them may end up being cheaper once that happens. Still, despite that glaring flaw, natural gas pool heaters are still recommended for plenty of homeowners out there. After all, even if they don’t last long, they typically are only half as expensive (or even less, in some cases) as compared to other pool heaters. That said, if you’re looking for a cost-effective solution to your pool’s heating needs, natural gas pool heaters may just be right for you. To help you choose, here are three of the best natural gas pool heaters available in the market today. Cost-effective and natural gas pool heaters don’t usually belong in the sentence, but Hayward has found a way to make it work. With its industry leading hydraulic design, the circulation pump run time has been reduced so much to the point that you’d end up having energy savings as high as 18% compared to other natural gas pool heaters. As a product of one of the leading manufacturers, this natural gas pool heater also comes with what many have come to expect from Hayward. This includes a standard Cupro nickel heat exchanger to lower NOx emissions, stainless steel burners, insulated combustion chambers and a 1-year warranty. This product doesn’t come cheap as it is one of the more expensive options. However, plenty of its customer reviews will prove to you that it is worth it. Many of its customers rave about how easy this natural gas pool heater is to install and how effective it has been in heating up their pools. Though, it’s worth taking note that some found it far too noisy than they expected, so it’s recommended to install it a hundred or so feet away from the pool to lessen the noise. Like the offering from Hayward, the Pentair Mastertemp also offers the same efficiency that’s not usually seen in a natural gas pool heater. Though, it does so in a much more user friendly package, complete with indicator lights, push-button digital controls and even a rotating digital display that makes operating this pool heater a synch. The Pentair Mastertemp is also fitted with all the bells and whistles you’d come to expect from a top-of-the-line product. This includes a rust-proof composite exterior, a water-pressure switch, manual gas-shut-off, a stack flue sensor and of course, a cupro-nickle exchanger for low NOx emissions. 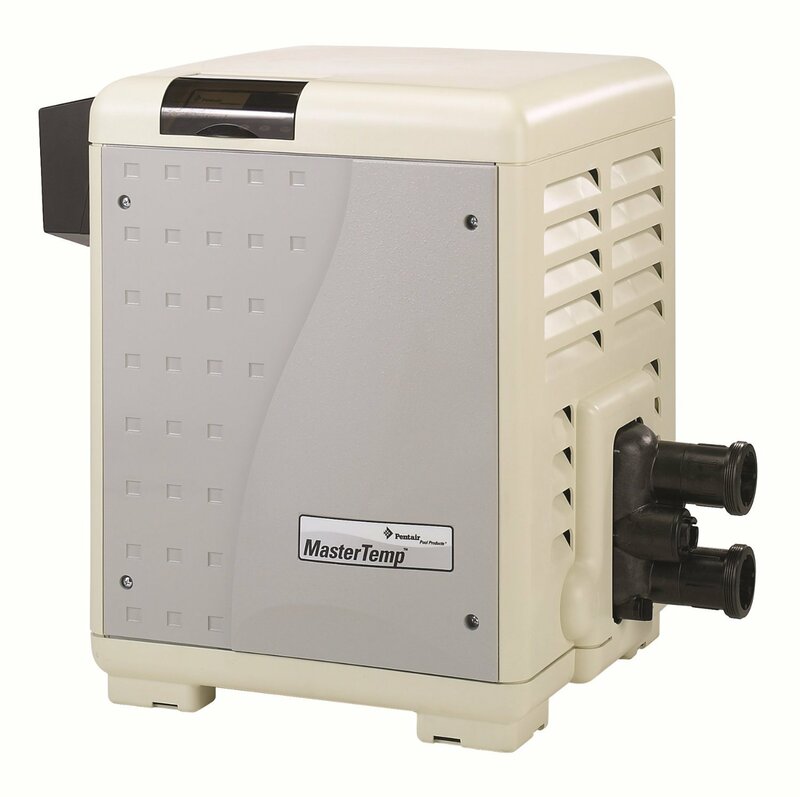 This natural gas pool heater is also unique compact and is not as bulky as compared to others in the same price range. This means that you can just safely tuck it away from your pool and in tight corners, something that’s not usually possible as far as pool heaters are considered. 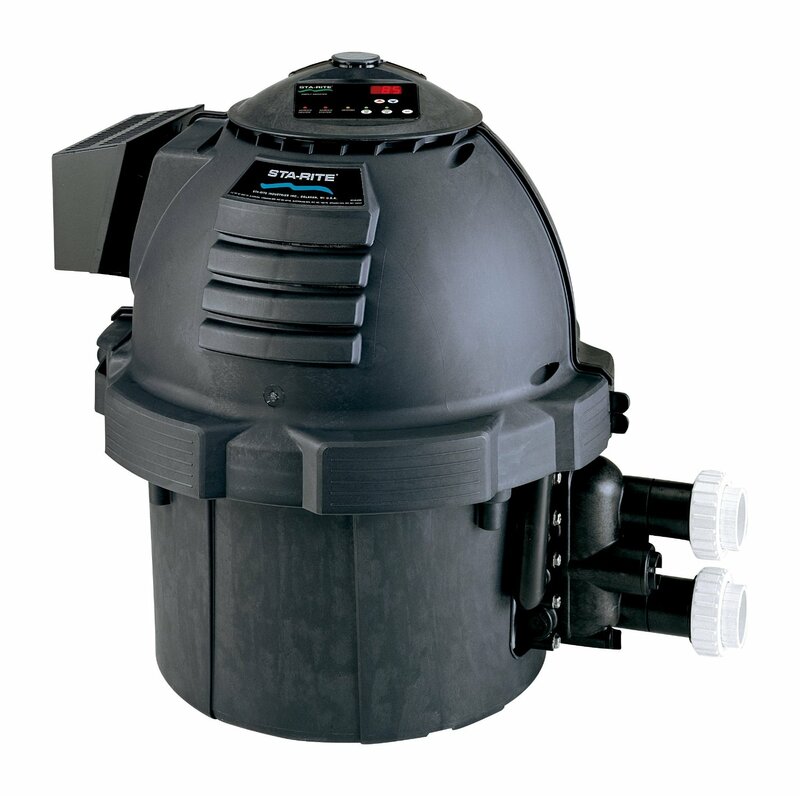 The unit is also quiet, according to customer reviews, which is good for those who don’t want to install their pool heaters too far away from the pool. 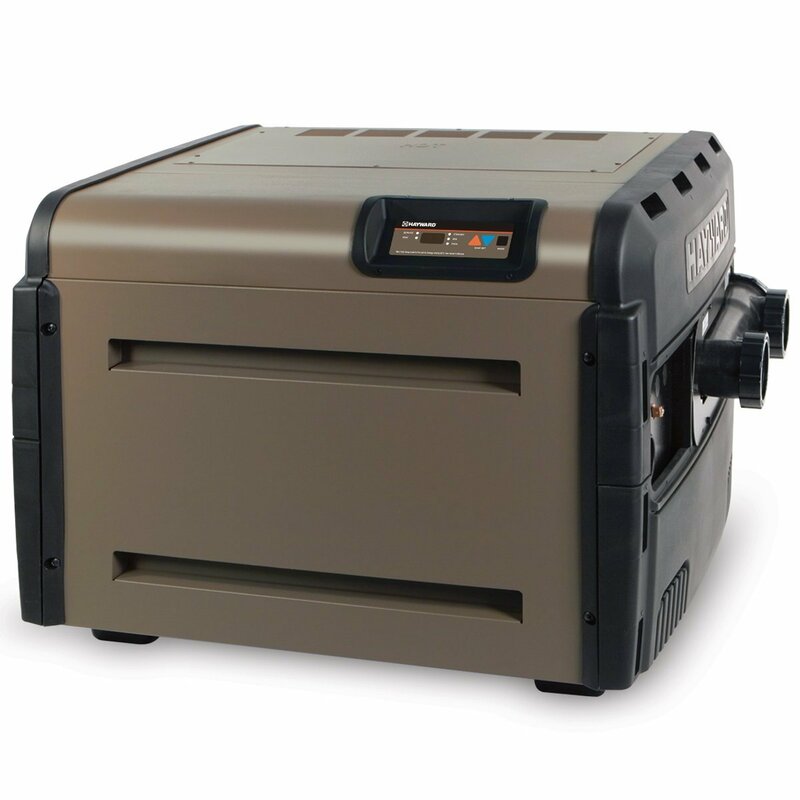 The Pentair Mastertemp is expensive if you purchase the 400-BTU model. Lower sizes, of course, are much cheaper. Natural gas pool heaters tend to heat pools quite fast, but this pool heater takes it to another level. Where others would take three or more hours, the Sta-Rite Max-E-Therm Pool and Spa Heater takes half that time and it does so without wasting as much energy. Housed in an egg-shaped design, the product’s unique enclosure allows it to handle heat well, as well as all sorts of weather. It also makes it quite easy to open for maintenance purposes should the need arise. Of course, this product is also fitted with the same bells and whistles as the other two mentioned previously. It’s eco-friendly and easy to operate. Though, it does have the upper hand as not only is it lightweight and durable, but it’s also rated to have much lower operating costs as compared to the other two mentioned. Considered as the lightest heater in its class, the Sta-Rite Max-E-Therm Pool and Spa Heater is priced in line with other natural gas pool heaters. Other smaller-sized models are available at a lesser price as well. It’s hard to go wrong with any of the three as they both have their own pros and cons. All three products have also had bad reviews about them, so it’s important to weigh things out first. Ultimately, your choice should come down with which company provides the better warranty or customer service in your area, as well as the amount of space you have for your pool heater. If you’re still uncertain of which pool heater to buy, read our pool heater buying guide.